They are set right to the gram. Obviously they used a calorie formula like Katch McArdle and they want to follow it the best they can for maximum results. The truth about calorie formulas is that they are all estimations. As your weight increases or decreases your body’s energy needs change. A heavier body burns more energy at rest and during activity. This means that as you progress towards your goal you will have to make adjustments to the total caloric intake. This is why when setting your initial fat loss numbers I recommend you to use the simple equations to estimate maintenance and set the deficit. You’ll have to adjust your intake anyway so we might as well start simple. How do you know if your fat loss plan is set correctly? After you follow your initial fat loss numbers for a week you look at results to see if you need to adjust them. The ideal rate of fat loss is between 0.7 and 1% of your body weight per week. For most people this means 1-2 pounds weight loss per week. Or 0.5 to 0.8 kg per week. You can lose fat faster than this. But the risk of muscle loss, strength loss, and low testosterone is increased. This is why it’s best to lose maximum 1% of your bodyweight per week. Now you’ll say wait a minute Radu… how do you accurately track weight change? Dieting, training and mental stress tend to increase cortisol levels which many times lead to water retention. This does not mean we’re not losing fat. The reduction in fat mass may be masked by the lack of weight change and increased subcutaneous water. After a few days (especially if we eat slightly more carbs and we relax) the water should be flushed out and we’ll see the reduction in weight and fat. A very high fiber intake also contributes to bloating. You can hit your macros eating 500g of food. Or you can hit the same macros eating 2 kilograms of food. Obviously you’re going to weigh differently based on how much you eat. You could also be constipated. This is huge. Did you know that you lose around 1% of your bodyweight through the moisture you exhale while sleeping? So you can imagine what a difference your daily water intake makes. Maybe yesterday you had 2 glasses of water more than usual, that’s why your weight is higher today. To solve all these tracking problems you need to do a weekly average. You weigh yourself every morning, in your underwear, after you used the bathroom. Then every 7 days, you do an average. That is your real weight. If that is going down every week by around 1%, your progress is great. But what do you do if your weight is stalling? This is where measuring your waist becomes important. Your waist circumference around the navel is a very good indicator of fat mass change. It may be possible for your weight to stay the same and your waist to go down. That’s reason for celebrating! Because it means you’re probably gaining muscle mass so fast that it equals the rate of fat loss. Your bodyweight stays the same, but you’re losing fat and gaining muscle at the same time. After several weeks of cutting, a lot of people report hitting a plateau when they no longer lose fat eating the same way as before. This is normal. Let’s see why. The first reason is simply because they’re lighter than before. 1. BMR (Basal Metabolic Rate) – this is basically the energy required to maintain life at a given weight. What you’ll see is that the total energy expended by all three consumers changes along with our weight and food intake. As soon as you go in a deficit TEF goes down simply because we eat less. BMR also goes down because we’re lighter. TEA goes down as well because a smaller body burns less energy during any activity. I want to expand a little on how closely related body weight and energy expenditure are. A lot of people think that lean body mass is the main predictor of calorie burn but this is not true. Contrary to what is commonly believed, skeletal muscle actually has a fairly low resting energy expenditure, roughly 6 calories per pound (13 calories per kg). In addition to that, fat mass which is commonly believed to be inactive tissue actually takes 2 calories per pound to maintain (5 calories per kg). Another interesting thing is that NEAT usually drops when you’re in a deficit. One of the ways our body tries to conserve energy during a deficit is by reducing spontaneous, unnecessary movements. This adaptation is more pronounced in some people than others but those who are low NEAT responders usually report feeling lazy or sluggish during a caloric deficit. IF we move less, we’re going to burn less energy. You’re probably familiar with the hormone called Leptin. Leptin is a master hormone involved in maintaining our metabolic rate and also controls hunger to a large extent. The amount of leptin we have depends on our fat mass and our food intake. When we reduce our calories and we start losing fat, leptin automatically goes down causing a series of adaptations: our metabolic rate is slightly reduced, hunger is increased, testosterone levels decrease, and NEAT goes down. What I found interesting is that the drop in metabolic rate is not linear. A slight decrease in calorie intake and fat mass produces a larger decrease in metabolic rate than what would be expected. So at the beginning of the diet we see a significant drop but then our metabolic rate remains relatively stable decreasing slowly as we lose more body fat. These things explain why the deficit we’ve initially set no longer works after a few weeks. Our lighter bodies use less energy overall. We eat less food and our metabolic rate has probably slowed down by 10-15%. When our weight stalls we’re going to have to reduce our calorie intake again or increase our energy expenditure. I recommend reducing calorie intake by 8-10%, increasing expenditure by 8-10% or do both at the same time (decrease intake by 4-5% and increase activity by 4-5%). Some people talk about “the starvation mode” and how it’s a mistake to create a calorie deficit again after we hit a plateau. Well what other way is there? In order to lose fat we must be in a deficit. No study has ever shown that a person’s metabolism can slow down so much that it will make it impossible to lose fat. Even in the Minnesota starvation experiment when the subjects ate only 50% of their maintenance calories they lost fat all the way down to the essential levels of 4- 5% body fat. So when someone says they are not losing fat because they’re eating too little, I would ignore them. – if you don’t lose weight, check your waist. If your waist is going down, keep doing what you’re doing. This is the fat loss plan I’m using. Some of you have asked me why I don’t create my own fat loss course. Well the reason is because I would completely rip off Greg. 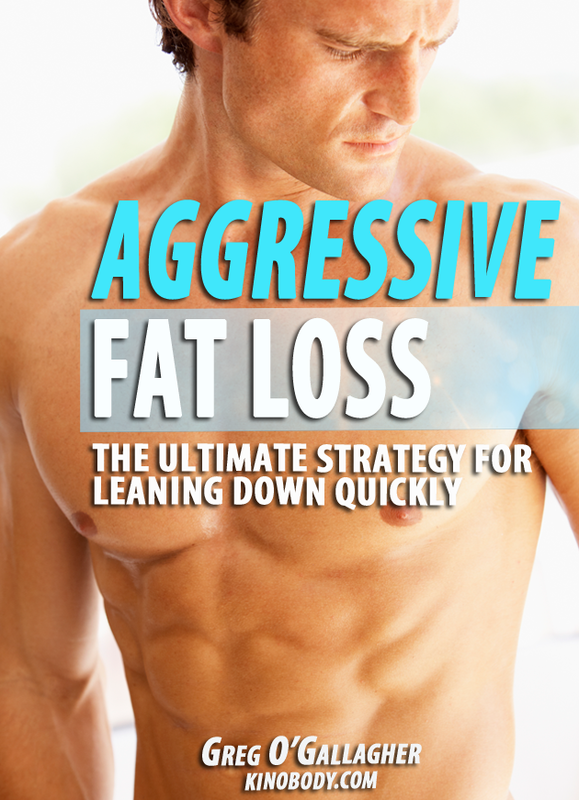 This is the best fat loss approach I’ve ever found. I personally haven’t found a way to improve it, I follow it myself exactly as it’s laid out. Greg may not be the most scientific or the most humble guy in the fitness space. But his stuff works. Intermittent Fasting, coffee during the fast, sparkling water, fruit snaking, splitting your protein and carbs in your big meal, those are little gold nuggets that make a world of difference. I highly recommend this program. You can learn more about it here. – when i take waist measurement does building my lower back affect on that ? – i’m now doing an aggresive fat loss going down to BWx10kcal and mostly from protein ( because am already lean and i have a pit of fat to loss it in 4 weeks ) is that save ? Indraznesc sa-ti cer cateva sfaturi si eu. Eu am 1,60 si 58 kg. Mi-am calculat cu ajutorul ghidului tau necesarul caloric, RMB etc, si mi-am setat un deficit caloric.Rezultatul era:120 g protein,50 carb, 48 grasimi, cam 1200 kcal la deficit..Din pacate, am un job de teren care ma tine departe de casa de dimineata pana seara si imi e destul de greu sa tin calculul macronutrientilor si sa fiu disciplinata in a manca intr-un mod corect.Timp de gatit nu prea am… Asa ca am trecut la un regim low carb(paine, fainoase, zahar – deloc, deloc prajeli, deloc cartofi, foarte stricta am fost) .De la 01.02 feb am mancat undeva sub 1000 kcal/zi, poate si 700-800, sport in fiecare zi la sala(kangoo jumps si functional training).Dar, din pacate , rezultatele nu sunt spectaculoase si sunt dezamagita.La sfarsitul lunii februarie aveam 54 kg, acum am 58.Am scazut in talie vreo 4 cm, dar cam atat.Aaaa si de la piept :(, din pacate.Dar brate, picioare , nimic.Sincer , nu stiu ce sa mai fac. Am inceput cu sala de prin august 2015, disciplina alimentara am cam avut mereu…Ce ma sfatuiesti? Hey Radu thanks for this! how many weeks u have to spend to know if ur diet is working or not? I mean u cant just adjust every week right? u have to give it time..
Hey Radu – I have been at a calorie deficit (11xBW) for 5 weeks and have lost 7 pounds. My lifting strength is increasing in the gym and I can see some visible changes in the mirror. However, my waist measurement has stayed the same. Is this normal? can you please comment on the Carb Cycling everybody is talking about?